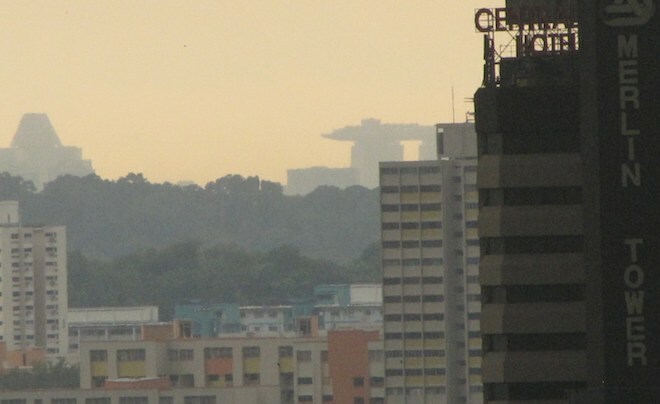 I just realized I can see Marina Bay Sands Skypark from my condo in Johor Bahru. Yes, it is basically a tiny image in the distance still I think it is funny I didn’t notice it until now. It is true when the air quality is not great or heavy rain showers are underway it isn’t visible. Since the photo is not exactly perfectly illuminating I’ll add that the skypark is shaped like a giant ship sitting atop 3, 55 story sky scrappers. It tops the Marina Bay Casino in Singapore. Less than 2 years ago Singapore opened 2 casinos (the other is the Resort World Sentosa Casino), those 2 casinos already are more profitable (I believe, if not they are close) than Las Vegas and Macao making it the most profitable gambling mecca in the world. The skypark costs S$20 to visit. The 340 meter long SkyPark with a capacity of 3,900 people. There is a 150 meter infinity swimming pool pool but it is only available to hotel guests. This entry was posted in Photos, recreation and tagged photos, recreation, tourist. Bookmark the permalink. Oh I just blogged about marina bay skypark . I dint know you could see it from jb . Are there any good places to visit in jb ? We always come there for shopping that’s it . Thanks, I like your blog. There are good places. I am pretty new, so far I am mainly limited to good restaurants and some decent places to shop. The Islamic Art center isn’t huge but it was a nice visit. The bird park (near it) isn’t great but it is decent. My guess is Singapore would have a better one. The zoo isn’t fantastic, unfortunately. It needs more funding if it is going to be good, I think. I haven’t been to the palace yet. I’ll be posting about these things and more over the next few months, hopefully, on my Malaysia/Johor Bahru blog. There are various temples I want to visit. VERY nice, was there a few weeks ago as we have an office on Marina Bay!! No smog up there!!!! The view from the New Asia Bar (70th floor) across to it is amazing as well!! Wow! That’s really neat. We love looking at it…especially at night. Hope to get up there one day.